There has been a growing recognition that planning ideas emerging from the industrialised economies of the ‘Global North’ are not necessarily appropriate in regions of the world with very different social, political and economic contexts. 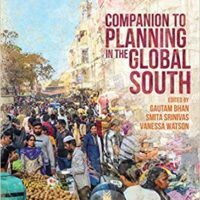 The Companion to Planning in the Global South offers a collection of essays on planning in parts of the world which, more often than not, are unrecognised or unmarked in mainstream planning texts. The Global South is home to much of the urbanisation of the 21st century; and the need of the hour is no longer to fill a ‘gap’ that leaves this ‘mainstream’ unquestioned, but to re-theorise planning from these geographies and from a commitment to diverse modes of practice. The five sections of this book discuss planning and the state; economy and economic actors; new drivers of urban change; landscapes of citizenship; and planning pedagogy. The chapters in each section are not generalised, ‘universal’ analyses and prescriptions, but instead are critical and located reflections in thinking about how to plan, act and intervene in highly complex city, regional and national contexts. The contributing authors to this Companion are all planners of very different kinds, and this diversity ensures a rich variety of insights, primarily based on cases, to emphasise the complexity of the world in which planning is expected to happen. This volume, edited by Gautam Bhan, Indian Institute of Human Settlements, Bangalore, Smita Srinivas, The Technological Change Lab and Vanessa Watson of the University of Cape Town will be of interest to urbanists, planners, urban economists, sociologists and environmental scientists, as well as practitioners across a range of urban sectors wishing to engage with new planning theory and practice from India and across the global South.